Most of us experience difficult emotions as a mixed bag of physical sensations and thoughts—usually in the form of a story we tell ourselves over and over. It is easy to get stuck in the cycle, but ruminating is rarely helpful. One skillful response is to give your mind a place to rest that is either neutral or positive, as with the focusing meditation offered above. Eventually, you may want to explore your difficult emotions mindfully in order to reduce your suffering and gain insight. To get unstuck, widen your scope of awareness beyond the story itself to your whole experience. What physical sensations are you feeling in your body? Drop the storyline, and dive into direct contact with your physical body. Where does this difficult emotion reside? In your belly, your heart, somewhere else? How big is it, what is its temperature, its shape, its texture? Once you isolate the physical manifestation of an emotion, you can use your breath as an anchor to the present. Recognize your feeling these sensations right now, not in the past or the future. Your mind and your body operate in tandem. A tight body can lead to a tight mind, and vice versa. Consider the possibility of relaxing areas of tightness, and explore the places where you are not feeling strong emotion in your body. 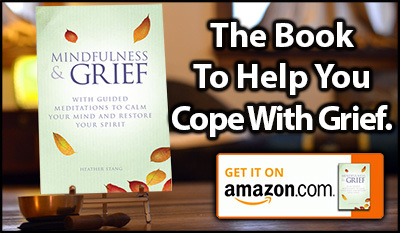 This practice of observing emotions without judgment can take away the “suffering of suffering” and let us feel compassion for ourselves while simultaneously widening our perspective on our experience of grief.